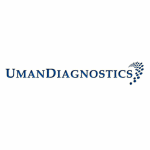 UmanDiagnostics specializes in the early detection of diseases of the brain. Our main focus is the development of immunochemical tools for fast and accurate determination of neurological and traumatic injuries. UmanDiagnostics has close collaboration with research groups at many departments at Umeå University and the company also collaborates with a number of Swedish and foreign biotech companies. Researchers at UmanDiagnostics have earlier been involved in the development of the diagnostic S-100 assay, indicated for monitoring traumatic brain injuries and patients with malignant melanomas. S-100 is today used worldwide for these conditions. The UmanDiagnostics NF-light® assay is an enzymatic two site immunoassay for quantitative determinations of NF-light in human cerebrospinal fluid. The assay has been shown to cross react with mouse, rat, bovine and goat neurofilament light chains. Following injuries to nerve cells due to direct trauma or slow neurodegenerative processes, the content of the cell is released into the surrounding compartment. Quantification of these proteins gives the possibility to follow disease progress and treatment efficacy.